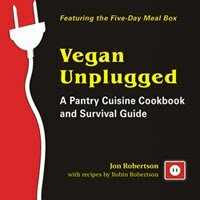 Vegan Unplugged: A Pantry Cuisine Cookbook and Survival Guide* by Jon Roberson with recipes by Robin Robertson has arrived just in time for hurricane, storm, and flood season, when so many people lose power. It’s a practical guide to stocking the pantry for emergencies and continuing to eat well when access to the usual fresh foods is limited. But Vegan Unplugged goes far beyond what to do during power outages; it’s great for road trips, hotel stays, boating, camping, and for simple dorm-room meals. There are tips on alternative methods of cooking, like camping stoves and gas grills; a 5-day basic survival kit, and much more. The pantry guide is an excellent resource for the everyday veg kitchen, not just for when the lights go out. Here are a couple of simple examples of what you can make with what’s in the pantry. When you need something to make you smile, try this salad. A combination of chickpeas, beets, and pineapple, it delivers good nutrition while lighting up your taste buds. The vibrant pink color may make you reach for your sunglasses. Cut the beets into 1/4-inch dice and transfer to a medium bowl. Add the chickpeas and pineapple chunks. Drizzle on about 1/3 cup of the reserved pineapple juice, the oil, lemon juice, and sugar. Season with salt and pepper, and mix well. Similar to a fruit crisp, this dessert is made in a skillet on a stovetop instead of in the oven. The basis of the crumble topping is healthful, toothsome oats. Yum. It’s also great made with apple or blueberry pie filling and can be a go-to dessert even when you’re plugged in but don’t feel like heating up the oven. A note from Nava: This one is an example of a recipe that assumes you have some source of stovetop cooking, like a camping stove or gas range, but no refrigeration; so it’s made entirely of pantry staples. In a medium bowl, combine the oats,sugar, peanut butter, oil, cinnamon, and salt. Mix well and cook in a 10-inch skillet over medium heat until toasted, stirring frequently to avoid burning, about 5 minutes. Scrape topping mixture back into the bowl. In the same skillet, spread the peach slices in the same direction in concentric rows. Sprinkle the reserved topping on top of the fruit. Cover and cook over low heat until hot, about 10 minutes.